As usual on Tuesday morning, the Master Gardeners were hard at work out in the Demonstration Garden. The plan for today: training the tomatoes. We planted the tomatoes just 2 weeks ago, and they’ve grown a lot despite wind, thunderstorms, and flea beetles. It was high time to give them some additional support in their growth. We are using 3 different systems of training/trellising tomatoes this year. 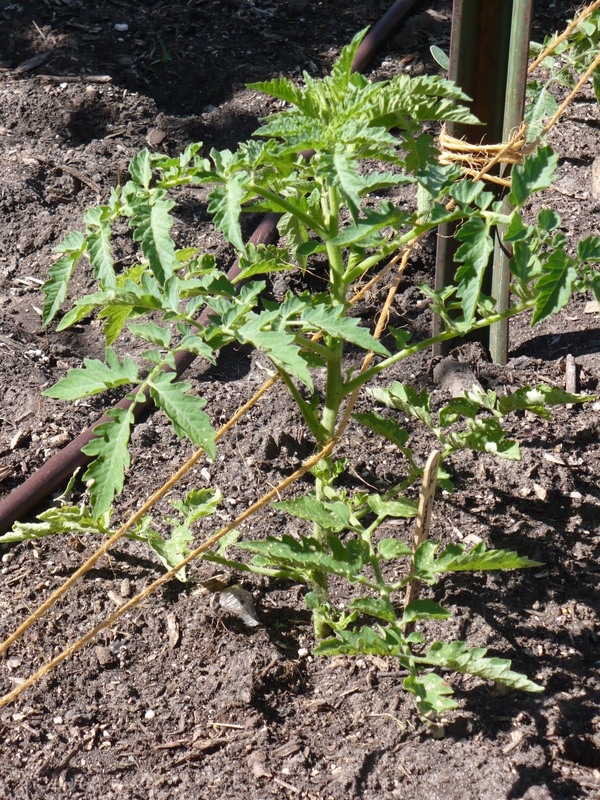 In the Family of 4 Garden, we are using the tomato teepee trellis that I showed here. The Roma Tomatoes are being grown in the traditional cages. Notice that we are using huge cages, not those wimpy little cone shaped things. We also tie the cages to a stake to help anchor them. The cages are easy to use, and only require handling once a season. (Well, twice if you count taking them down.) They don’t provide much support until the plants are quite a bit larger, so the wind is still an issue. 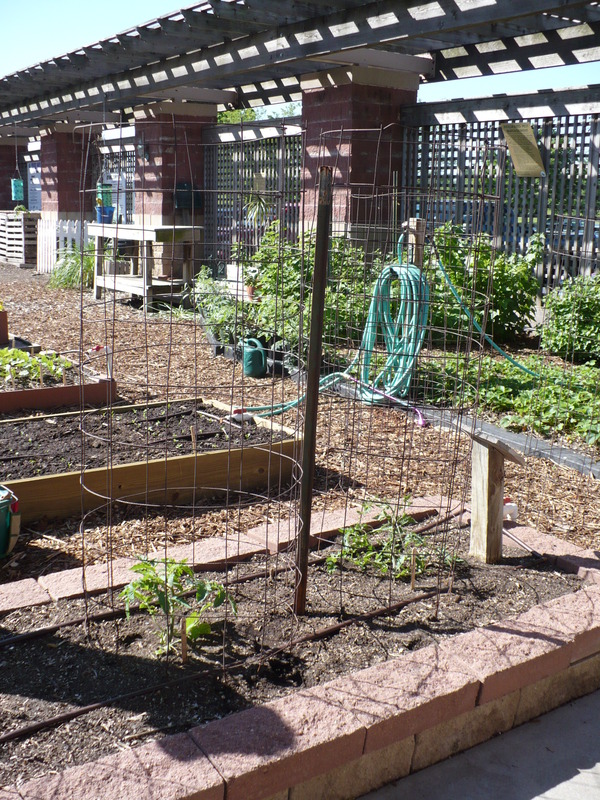 As the plants grow, the cages will be great at encouraging them to grow up, rather than flopping onto the ground. This systems uses only metal fence posts and strong twine. Much cheaper and easier if you have lots of tomatoes or not much space for storing the cages! The twine is tied to the first post, then strung tightly between the posts. The taught twine holds the plants upright. Another level of twine will be strung approximately every week at about 10-12 inch intervals. This picture shows more clearly what the system looks like. Florida Weave is easy once you get the hang of it. I think it is one of the most enjoyable parts of growing tomatoes! If you are interested in learning more about different methods of training and staking tomatoes, especially the Florida Weave system, I will be holding a free demonstration next week. Thursday, May 28th at 6:30 p.m. This demonstration will teach the basic materials and methods for using the Florida Weave staking system in tomato production. After the demonstration there will be a tour of the Demonstration Garden, particularly of the variety of spring vegetables and fruit. Posted on May 19, 2009, in Upcoming Events, Working in the Garden and tagged Garden plan, Tomatoes, vegetable gardening, Vegetable gardening class, Wichita garden classes. Bookmark the permalink. 6 Comments. I have a request rather than a comment. Is there a resource that precisely describes how the stringing tool is made for use with the Florida Weave system? To make tying convenient, a homemade stringing tool can be made. The tool will work as an extension of your arm which limits the amount of bending you will need to do. Take an old broom handle or a shortened tomato stake, about 2 feet long, and drill two holes one inch from each end. The holes must be wide enough to allow the string to be fed through. Attach the box of string to your belt and thread the twine through both holes. Tie the end of the string to the first stake, about 10 inches above ground level. You are now ready to weave. 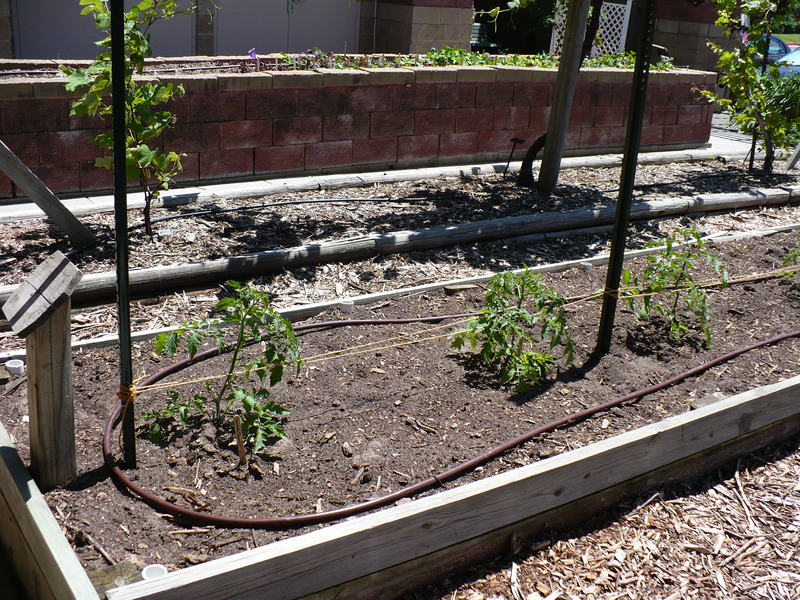 Use the stringing tool to pass string along the near side of the first tomato plant and the far side of the second. Hey, I was looking for some wisdom before I have to start weaving my tomatoes. I am using 2x2x8′ posts and nylon twine. I have concerns that the twine will slide down the post over the growing season and would like your opinion and possible solutions that you use. Thanks for your help. I usually have used metal fence posts that have some natural grooves in them. It sounds like you’re using wood posts? I think my suggestion in that case would be that you make some notches or grooves in the posts and then make sure you get the nylon twine nice and tight. The biggest issue is the twine stretching under the weight of the plants.